Takeaway #1: Before Ogilvy, Rolls-Royce simply declared themselves “the best car in the world”. When Ogilvy came on board, he focused on proving that statement. Lesson: You can’t just call yourself the best at anything & expect people to believe it, no matter who you are. Instead of starting with the headline “The best car in the world”, Ogilvy incorporated it into the deck copy or opening paragraph, often using it to describe the car vs. calling it a “Rolls-Royce”. In a few ads, he turned it into a question “what makes Rolls-Royce the best car in the world?” which lead to a list of facts he compiled to convince you of that statement. Takeaway #2: He conducted research for 3 weeks. Lesson: All you have to do is look at the incredibly specific & meticulously stated facts to realize that Ogilvy learned every detail he could about the car to set himself up for a brilliant ad campaign. He knew that deep research is what leads to a killer big idea. It’s worth noting that before working with Rolls-Royce, he had zero experience with automobile sales. Takeaway #3: He wrote out & presented 26 different headlines to Rolls-Royce. Lesson: This was common & possibly even on the lower end for a typical Ogilvy campaign. Today, many companies including popular blog Upworthy attest to writing out & testing at least 25 headlines per post. Takeaway #4: He quoted reviews from automobile magazines in almost every ad. Lesson: Just like how modern-day copywriters reference Amazon reviews for copy inspiration, Ogilvy utilized reviews written about the Rolls-Royce, but from print editorials. In several ads, he incorporated quotes into the subheads or bolded them within the body copy so they stood out. He always cited the name of the magazine, which gave credibility to the quote. Takeaway #5: He knew how to swipe & use inspiration. 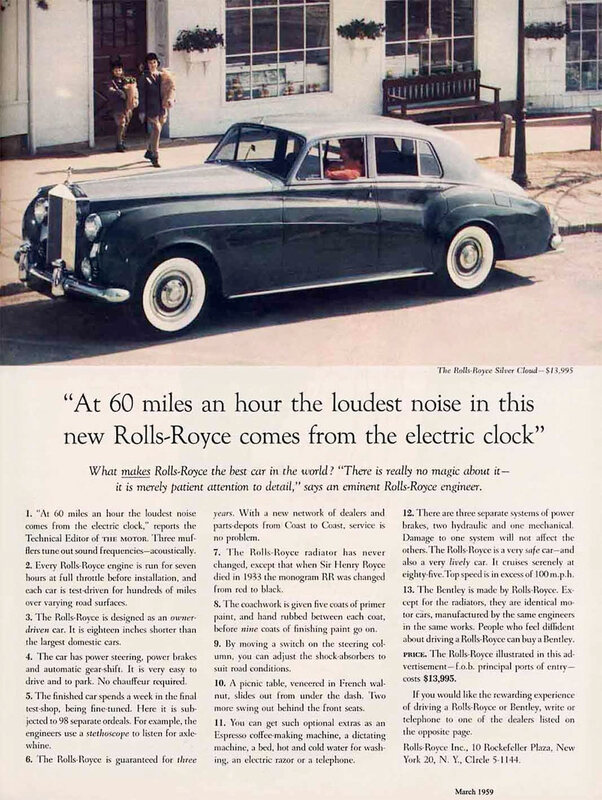 Lesson: Ogilvy’s most famous headline “At 60 miles an hour the loudest noise in this new Rolls-Royce comes from the electric clock” was directly swiped from a quote he read in a British motor magazine. He openly admits he didn’t write it: Link. On top of that, an ad from 25 years earlier for automobile brand Pierce & Arrow used an almost identical headline, “The only sound one can hear in the new Pierce Arrows is the ticking of the electric clock”. Charles Brower of BBDO, the agency behind the 1933 ad, wrote to Ogilvy about it, but Ogilvy stuck to his story & insisted his inspiration came from the magazine article. Takeaway #6: Rolls-Royce’s budget was a measly $50,000, “less than two percent of the Cadillac budget”, as Ogilvy pointed out. Lesson: Even though the budget was small, Ogilvy gave it everything he had & ended up paving the way for a number of big accounts like Shell Oil, who hired him because of his work with Rolls-Royce. Takeaway #7: Once he didn’t believe in the product, he stopped working with them. Lesson: This is one of my favorite takeaways from this campaign & a signifier of how Ogilvy’s worked. He saw their quality go downhill, screwing up new features like air conditioning & automatic shifting so he wrote them a letter about why he no longer wanted in. He was surprised when they didn’t take any offense. The head of Rolls Royce, who was an engineer, wrote back saying “I don’t blame you at all. I think you have a point”. Ogilvy actually owned a Rolls-Royce, but it was a pre-owned 1932-1933 model. Lesson: Both publications, especially The New Yorker, had upper class readers that could afford a Rolls-Royce. Takeaway #9: In every ad, he followed a go-to structure of putting a large attractive photo of the car, a headline and long copy in a 3-column format. This went against typical automobile advertising & it worked. Takeaway #10: He used a variety of different headlines & angles with different appeal, even though the body copy was mostly the same. Lesson: This way the ads always seemed fresh & he could test out what had the most impact. 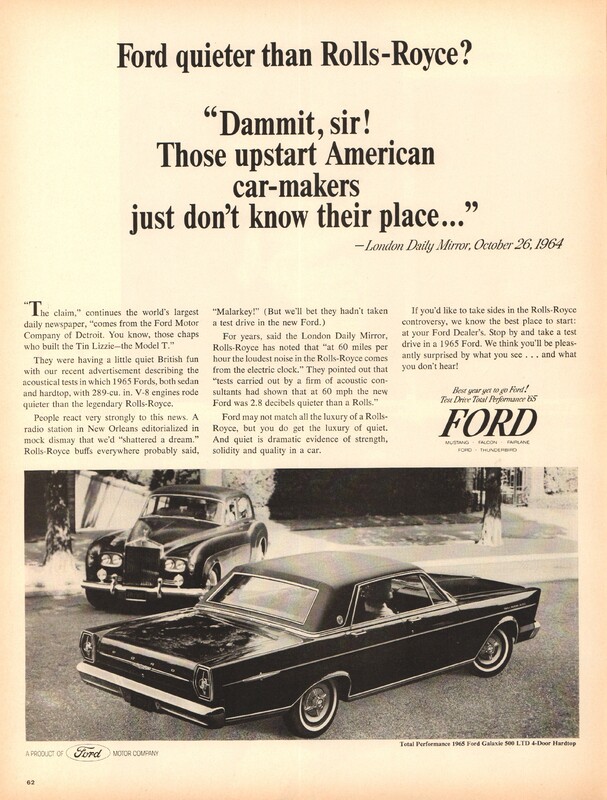 Takeaway #11: He focused strictly on the facts & unlike most automobile ads, used lots of copy. Commandment #1: Your role is to sell, don’t let anything distract you from the sole purpose of advertising. Commandment #2: Clearly define your positioning: What and for Who? Commandment #3: Do your homework. Study your consumer in detail. Commandment #4: Think of the consumer as a person, she wants all the information you can give her. Commandment #5: Talk to them in the language they use every day. Commandment #6: Write great headlines and you’ll have successfully invested 80% of your money. Commandment #7: Highlight the product by making it the hero.